I have a terrible sniffer. I can barely discern all but the strongest scents, but this afternoon the garden was filled with sweet fragrances. 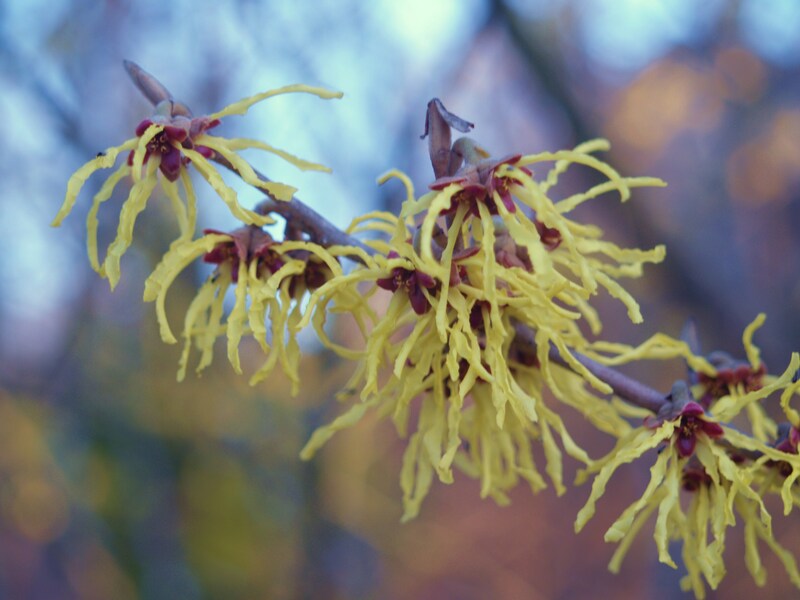 The blooms of the vernal witch hazel (Hamamelis vernalis, below) are beginning to fade after six weeks, but its scent was evident from halfway across the rear garden. 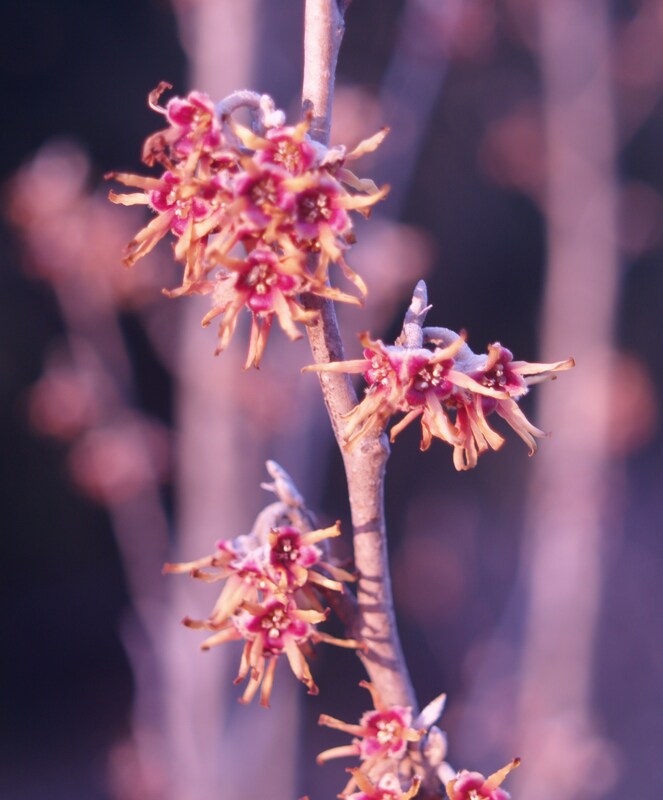 Perhaps it would have attracted my attention from further, but the large ‘Arnold Promise’ witch hazel (Hamamelis x intermedia, below) is fully in flower and its scent was even stronger. It began to flower early in February and I expect that the flowers will persist for several weeks longer. In recent winters I’ve savored these as lone blooms in a snow covered garden, but of course in this abnormally warm winter there have been many flowers. The winter daphnes have teased with dark pink buds since late in December, but only now are the flowers opening. There is a slight scent today, but as the blooms open fully after a few more warm days this will increase so that I’ll detour each evening when I return home to investigate. 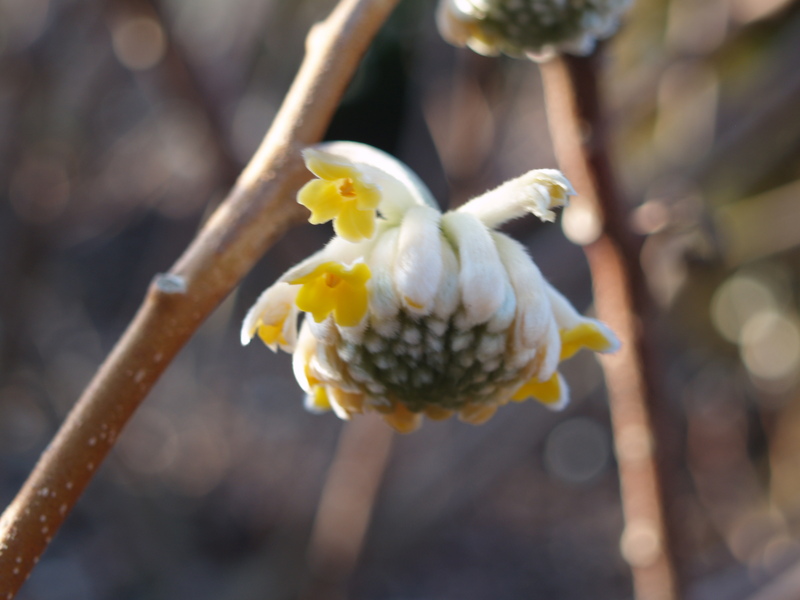 I’ve read that the paperbush (Edgeworthia chrysantha, below) is fragrant, but I’ve not been able to detect it on the four wide spreading shrubs in the garden. I adore the blooms, which are just beginning to show their first color. In another week, when they’re in full bloom I’ll take care to visit them on a still, sunny evening when the scent is likely to be the strongest. Soon, there will be hyacinths, then sweet viburnums and all manner of fragrant blooms, but when the trees and shrubs are bare there is no better time to enjoy the scents of late winter.